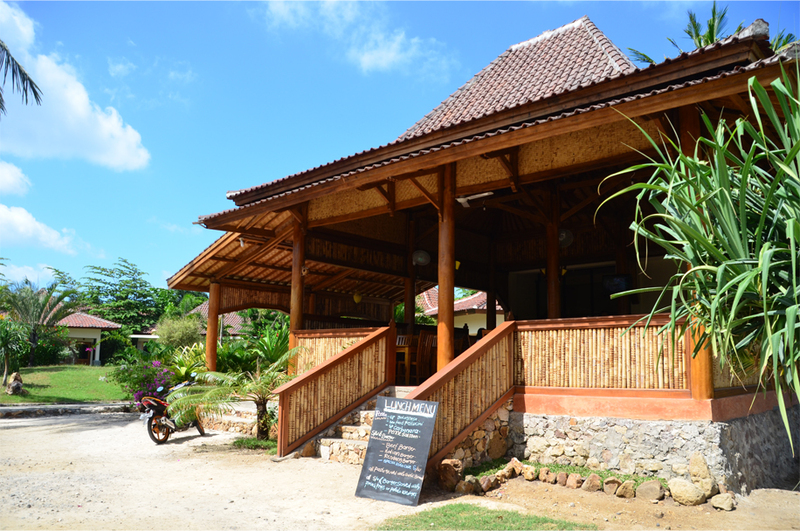 Arriving in Kuta, we were thrilled to learn that Third Moon Café – the restaurant attached to our small hotel – served a good selection of local dishes. Washed down with tall glasses of blended pineapple, mango and papaya, we would try out every single one over the next four days. Ayam taliwang, a sweet and spicy grilled chicken slathered in an addictive blend of coconut, chilli, garlic and shrimp paste, was the perfect introduction to Lombok’s Sasak cuisine. 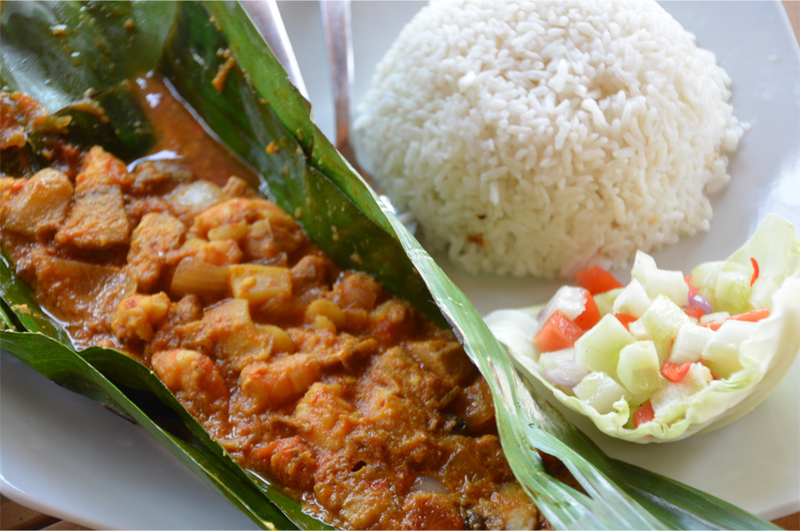 It instantly became one of my favourite Indonesian dishes, so much so that I would sometimes enjoy it twice a day. 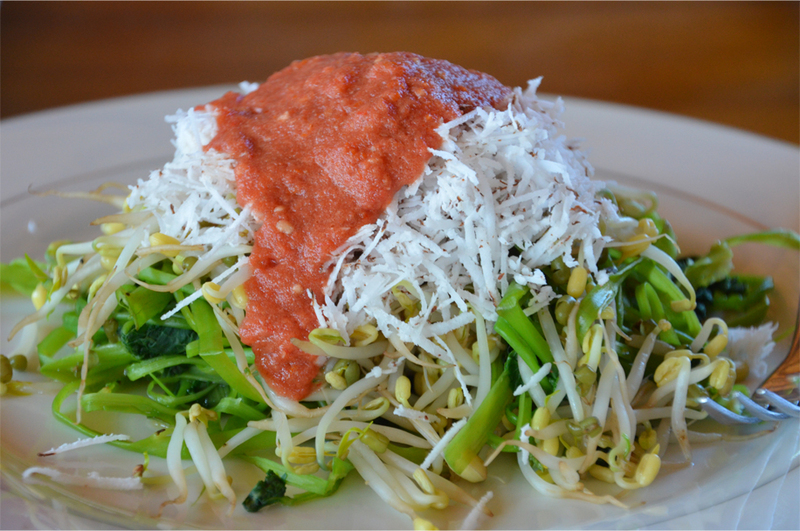 Pelecing kangkung looked deceptively tame, a veritable mound of water spinach, beansprouts and grated coconut served with raw tomato and chilli sambal – packing a secret punch that seemed to explode off the tongue. We could not resist the pepes seafood, a delightful jumble of fish, shrimp and squid, wrapped in banana leaf and held in position by several strategically-placed toothpicks; or the skewers of sate pusut ayam dipped in a rich peanut sauce. Ikan bakar pelecing, grilled fish cooked in sambal, proved much milder than I had anticipated, while urap-urap was a pleasure with its heaps of freshly shredded coconut, infused with an aromatic blend of spices. 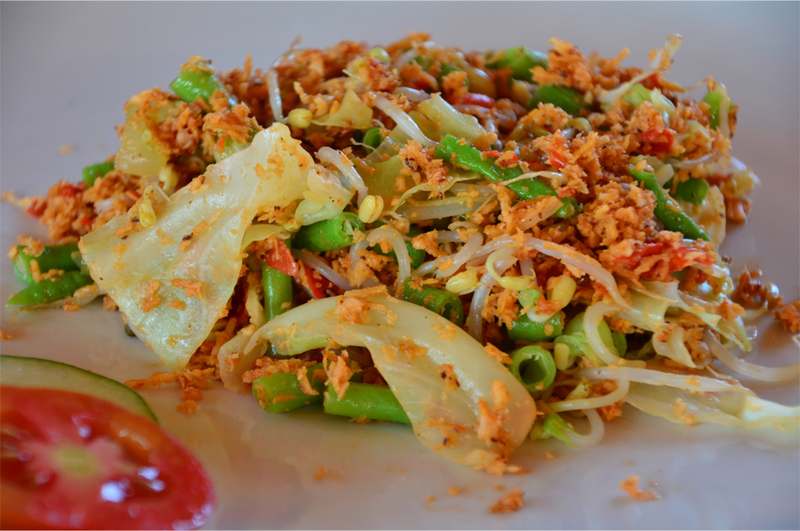 One of the many joys of Indonesia is its culinary diversity, and Lombok clearly did not disappoint. Looks absolutely delicious! We want some! It was fabulous – I loved all the flavours and spices in each one! Tasty! This post has me salivating! Hmmmm…how I do love to read your food posts. Thanks for making me hungry again — that ayam taliwang looks particularly enticing! I’m glad you added one more dish to your favorite Indonesian dishes. I still remember how desperate I was in asking them to add more chili to my ayam taliwang. On day 1 it was not spicy at all, then on day 2 it got better, but on day 3 they really made it pedas banget! 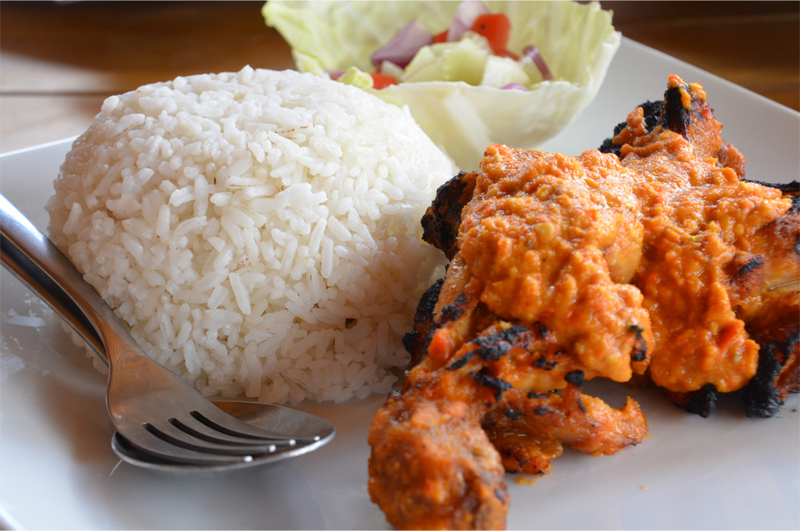 But it couldn’t beat the ayam bakar taliwang I had on my last day there – that one set my mouth on fire! Thank you James – I’m craving some good, honest Indonesian food right now, just 10 days after coming home from the trip. Haven’t been to Bali yet, although I do hope to change that quite soon! Looks good!! Can’t wait to try some for myself. I hope it didn’t make you too hungry! 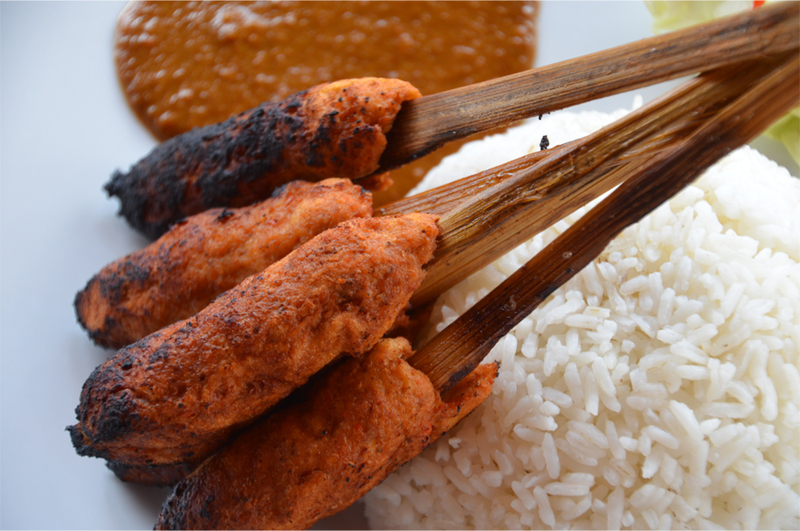 The food is one of the highlights of Indonesia, especially if you have a soft spot for spice! I miss all of these dishes – sadly there is no ayam taliwang where I’m from! you know that line. cool. Sangat Indonesia!!!! I might have to find one Indonesian restaurant in my neck of the woods and see if Ayam Taliwang is on the menu. Or anything perhaps that vaguely resembles Sasak cuisine. Ayam taliwang must be pretty hard to find outside Indonesia – it’s not nearly as famous as rendang, sate or nasi goreng. Reblogged this on Holiday Rent Club. Ah every single dish you have showcased looks wonderful James! 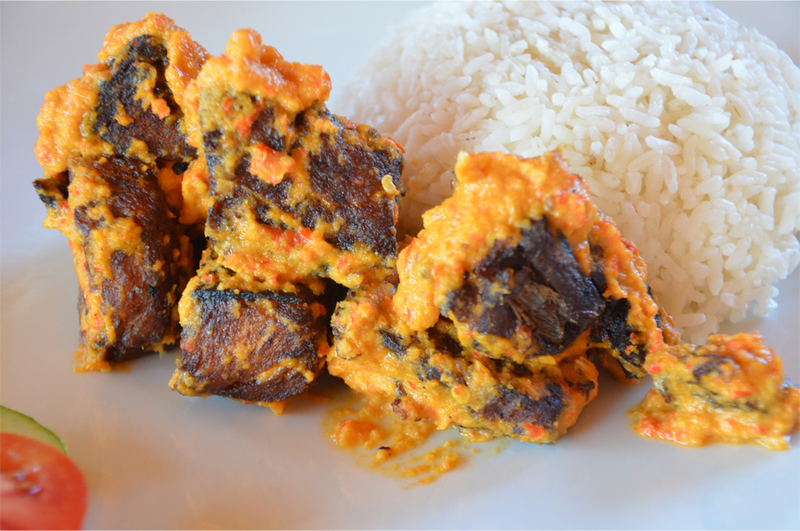 Was the rice as fragrant and delicious as in Laos? They were all delicious, Madhu! The rice was lovely but my favourite part was almost always the sauce – especially if grated coconut and shrimp paste were involved. That was a perfect combination with the tender meat and crispy skin of ayam taliwang!